It makes absolutely no sense to purchase an expensive drysuit if you don't know how to keep yourself safe and warm. A Gore-Tex drysuit has no insulation properties at all. The drysuit will keep you dry, but not warm. If you don't wear the correct clothes underneath, you will be at serious risk of harm. Cotton clothes has no insulating properties when wet. You will certainly sweat when you are wearing a drysuit when you are paddling and cotton clothes will not protect from the cold. Even though wool has insulation properties when wet, wool takes a long time to dry out, thus keeping you cooler. Depending on the type of drysuit you have, the colder you will be. A non breathable drysuit will retain perspiration so the choice of clothes underneath becomes even more important. 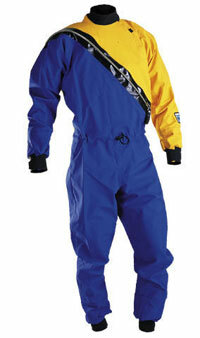 A breathable drysuit will be warmer since the perspiration will leave the drysuit and the underlayers will be less wet. If you stay wet from your own perspiration, it can lead to hypothermia. The best clothes to wear underneath a drysuit is multiple fleece and synthetic layers. The temperature of the water temperature will determine the amount of clothes needed, not the air temperature. Start with a thin, short sleeve synthetic top and add enough layers of fleece to keep you warm. Fleece is rated as 50, 100, 200, 300, etc. and the higher the rating, the warmer and thicker the fleece. Make sure that too much fleece is not warn as overheating is a problem, too. The most overlooked part of keeping warm is the head. If the drysuit has an attached Gore-Tex hood, the appropriate clothes have to be warn underneath the hood. This might be a fleece cap, a neoprene cap, etc. If your feet are cold, you will be cold... no matter how warm the rest of your body is. If the drysuit has Gore-Tex socks as a part of the drysuit, then your feet will be protected from the water. But the socks have no insulating properties, either. Always wear warm socks and the appropriate paddling booties. Wear either poggies, neoprene mittens, neoprene gloves or a combination of poggies and gloves (during extreme cold weather). If you hands become cold, it will be very unpleasant and potentially dangerous paddling experience. When you capsize and go into the cold water, you might get cold shock if the appropriate clothes are not warn. Cold shock is a very dangerous situation that can lead to possible death and it usually occurs because your head and face are not properly protected. Choosing the correct clothes to wear underneath a drysuit is critical for safe paddling.